One of my favorite things to do in our homeschooling curriculum is to tie all of our subjects into history. Art, music, science, math, you name it. If we can relate it to our history study, we do! Recently I was given a chance to review a new product from one of my favorite companies, and it does just what I had hoped. 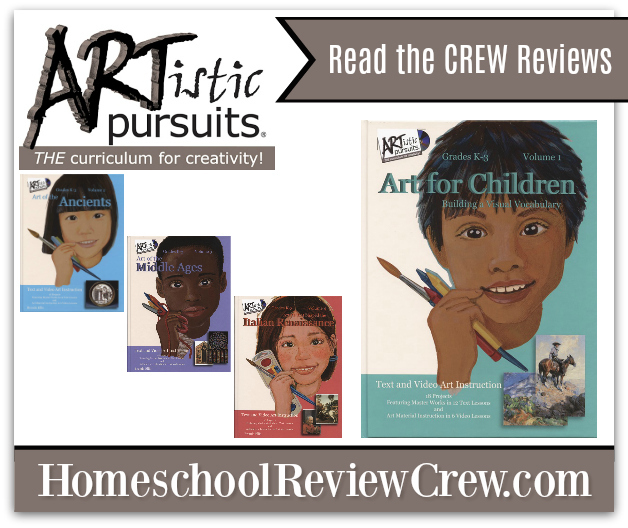 It is an art curriculum centered on Ancient History! I’m here to tell you all about ARTistic Pursuits, Inc. and their new Art Instruction Books with DVD and Blu-Ray curriculum. We got to review the Art of the Ancients! This course is intended for kindergarten through third-grade students. It was an excellent fit for my 8-year-old daughter Joyanna. What arrived in our mailbox was a lovely hardcover book with two DVDs tucked into pockets in the cover. The particular curriculum focuses on the ancient cultures that were found along the Mediterranean sea. The first lessons center around the cave drawings in France before branching off through ancient Egypt, Greece, and the ancient Roman Empire. Included within the pages of this art course is information about the history of the region as well as the art. Altogether there are 18 lessons included between the book and the videos. To complete the lessons you’ll need some basic materials on hand. Pastels, clay, construction paper, some tools like a wire clay cutter and other clay sculpting materials are nice to have, but we were easily able to substitute with basic items like a kitchen knife. Before each new section in the book, the student watches a short DVD lesson. Most of the videos were just 5-10 minutes long, and they go into detail about how to use the materials and some various artistic to techniques to achieve the effects in the upcoming projects found in the book. Every lesson starts with some historical information about the kind of art the student is about to create. They learn about cave paintings for example before they attempt to replicate them. There is an interesting lesson about a human three-foot-high statue found in a pit in Jericho that the student then gets to try making a mini replica. They learn about Egyptian Paintings, murals, reliefs, architecture, art in tombs, and so much more. These lessons are simple yet rich. Each time we attempted a new one I would read all of the text aloud to my daughter. I didn’t need to, and she is capable of that, we like to do that together. Then she’d follow the directions and try to create the assigned project to the best of her ability. We usually spent a half an hour, MAYBE 45 minutes on a project. That mostly depended on how long she wanted to put effort into it. She enjoyed spending more time with clay for example. We completed one or two projects a week, and she is very much looking forward to finishing the rest of the ones we haven’t gotten to yet. Overall this curriculum is very enjoyable, simple yet rich, easy to follow, and perfect if you are studying the ancients in your history. I think I’ll be buying the Art of the Middle Ages for her when the time comes. Check out all that ARTistic Pursuits, Inc. has to offer by checking out their website, Facebook, and Twitter pages and be sure to read a few other reviews of their products by clicking the banner below.